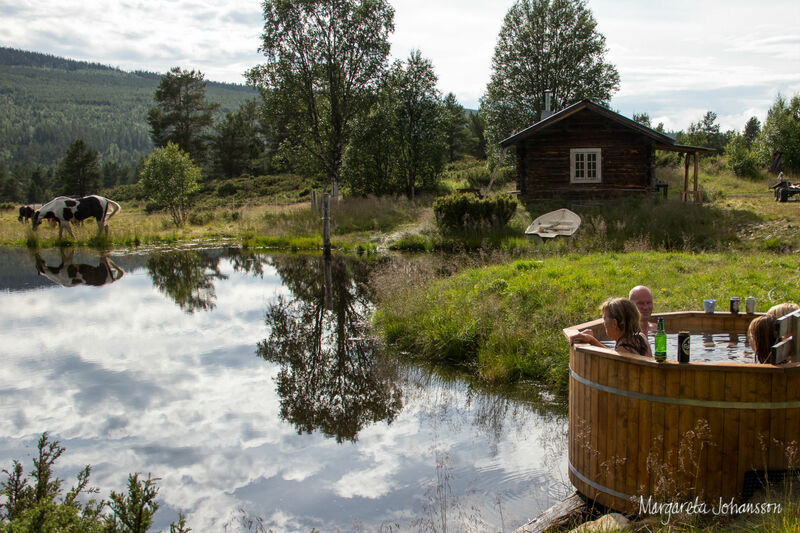 Trumvallen is an old summer farm, a shieling, just a few kilometers from the Vemdalen Ski Area. 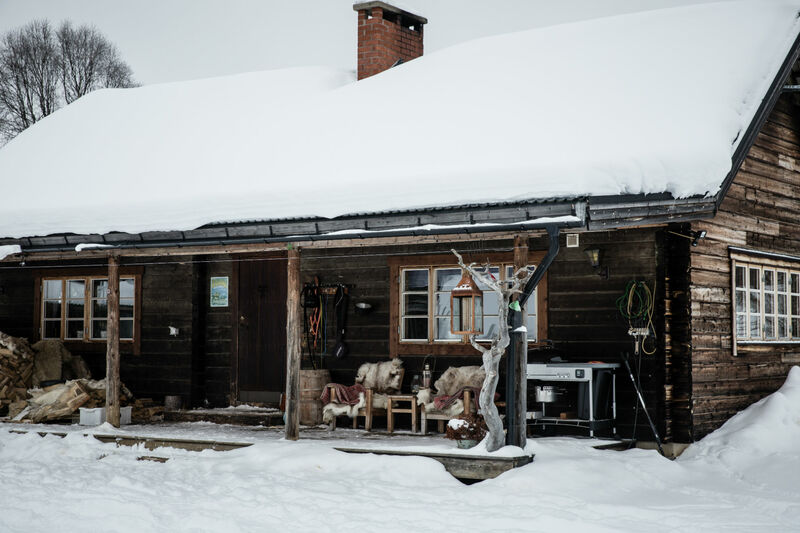 The summer farm is a group of sun kissed log houses in different shades of grey with the beautiful backdrop of the Härjedalen mountains and pine forests. One of the houses holds a ranch where you can go horseback riding western style. 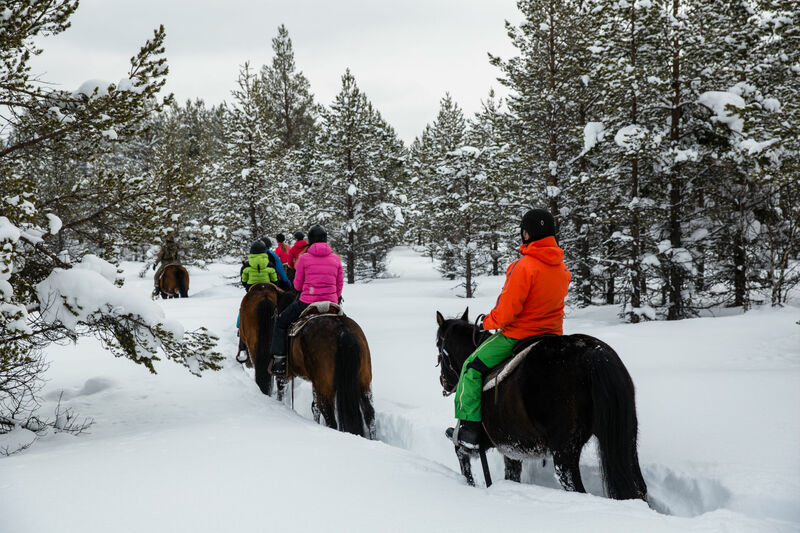 A perfect activity if your legs just wohn´t last that whole week of skiing and you want to experience riding through a Swedish winter wonderland. 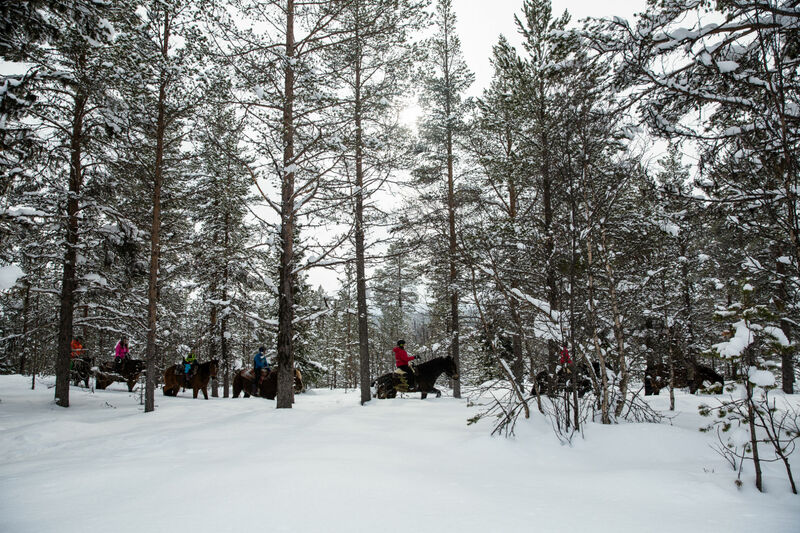 At first it felt strange riding western style, sitting on a high horse and riding on a path through deep snow, but the horses were as calm as the surrounding landscape embedded in a fairytale layer of snow and we soon got the hang of it. We rode slowly in a line through a layer of meter high powder snow through a pine forest. Further away we could sense the silhouettes of the surrounding mountains that hazy winter´s day. A faint sunlight painted a fantastic pattern on the snow as it beamed through the trees. Before the tour we were given instructions on how to communicate with the horses to make them go where we wanted them to go, how to start and stop. As an inexperienced rider it was amazing to see how this actually worked. We were riding neckreining, meaning riding holding the reins in one hand. We felt like we were stars in a movie about the wild west. The snow flies around the horses as they move through the forest. The large horses move smoothly in spite of their massive bodies and they radiate strength. The breed is called North Swedish and is one of three swedish breeds of horses. This breed was traditionally used for forestry and agricultural work. It is agile and easy to work with, strong and durable. 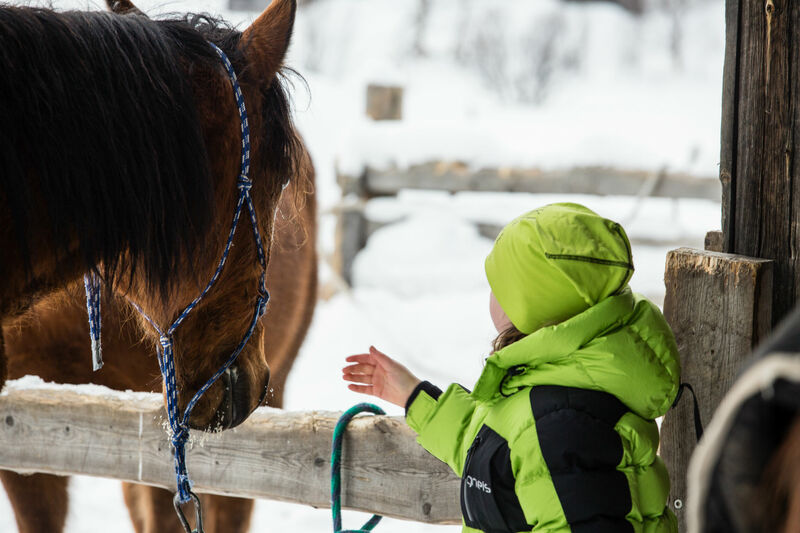 Typical characters for the North Swedish horse is that it is gentle and willing. It is also known for its longevity and good health. Our ride is called the forest tour and it lasts for 1,5 hours. 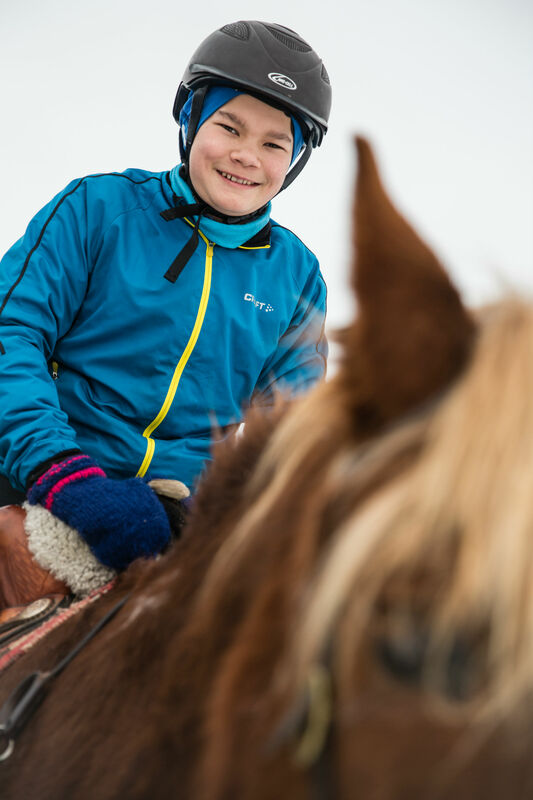 We are riding on a trail and we noticed just how deep the snow is on the side of the trail as we made an attempt to make a new trail and the horses sunk up to their noses. Back at the ranch we feel a bit sad to leave the horses as we have started to bond with them. Their friendly eyes watched us from behind the forelock and as we pet them goodbye they made a sort of snorting sound. 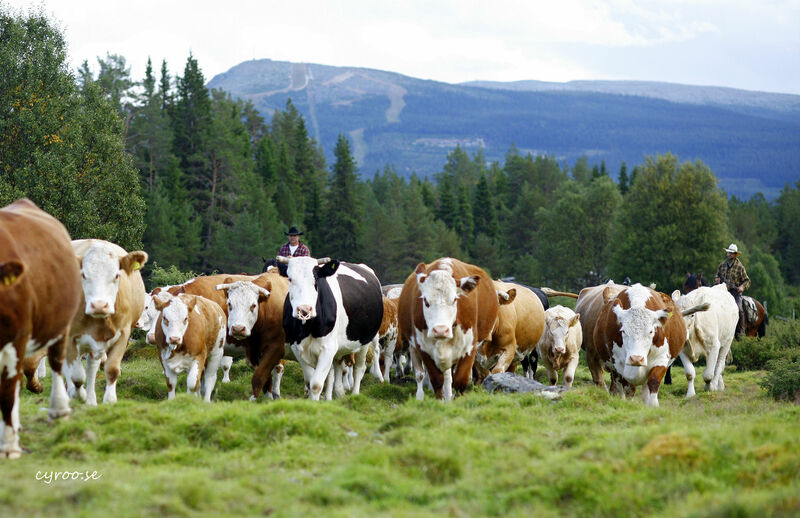 By the National Park Sonfjället close to Hede there is a shieling called Nyvallens fäbod with mountain cattle grazing on the slopes of Sonfjället. In Östra Arådalen, Oviksfjällen, there is a shieling with mountain cattle grazing side by side with reindeer. The shieling produces cellar matured cheese. Go there by the Fäbodvägen road leading between Persåsen and Börtnan to see a large number of old shielings. Today most of these are privately owned and used as summer houses. 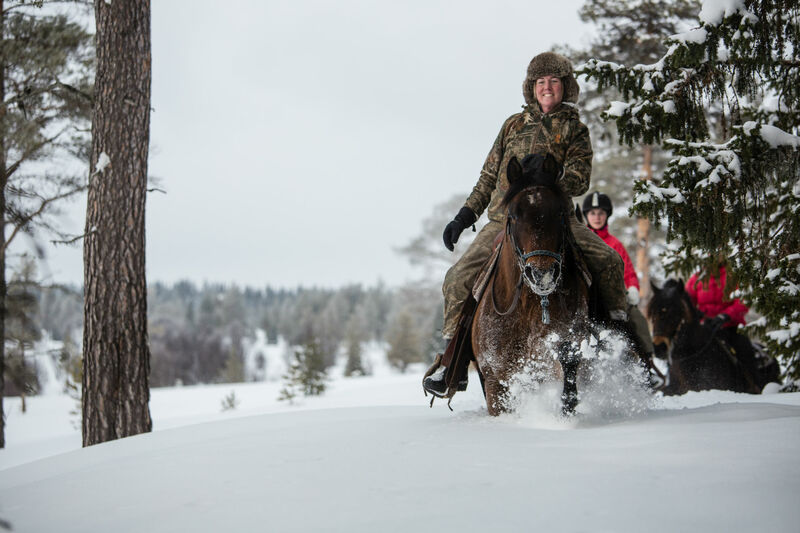 The Trumvallen Horse Ranch is managed by Johan Persson and Hanna Högberg on land inherited through generations on Johan´s side. Managing the ranch the way they do it today is living the dream. It is just amazing meeting people from all corners of the earth and hearing their life stories during a ride, says Johan in a passionate voice. The ride was both peaceful and exciting, definitively giving us a taste for more! Hanna told us about one of the summer tours to a nearby mountain top, Oxsjövålen, some 1 000 m. a. s. l. with an outdoor lunch cooked by the lake Oxsjön. She also told us that we were welcome to join in summer to help herding the cows from one summer grazing spot to another and staying in shielings, cooking our meals over open fire. Now we knew we have to be back! 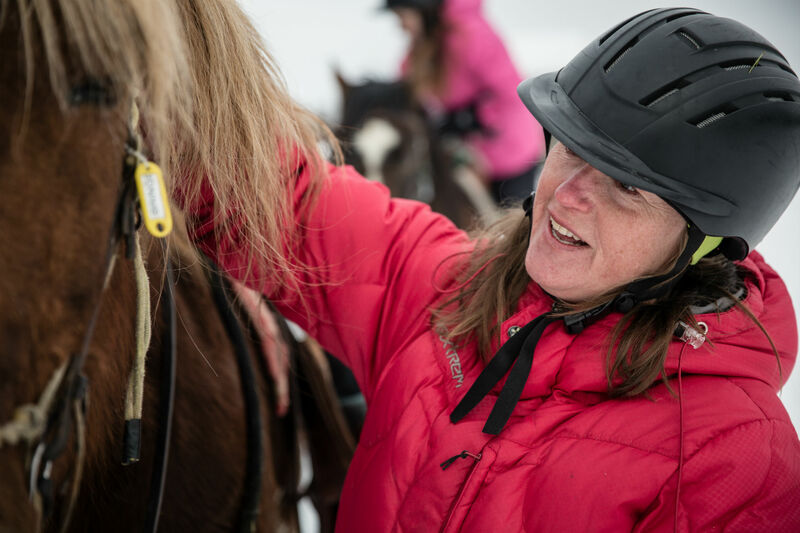 The riding tours at Trumvallen are on offer summer and winter. In winter the tours are a bit shorter due to the colder climate. Tours for smaller children where the parents lead the horses are 30 minutes long around the shieling. 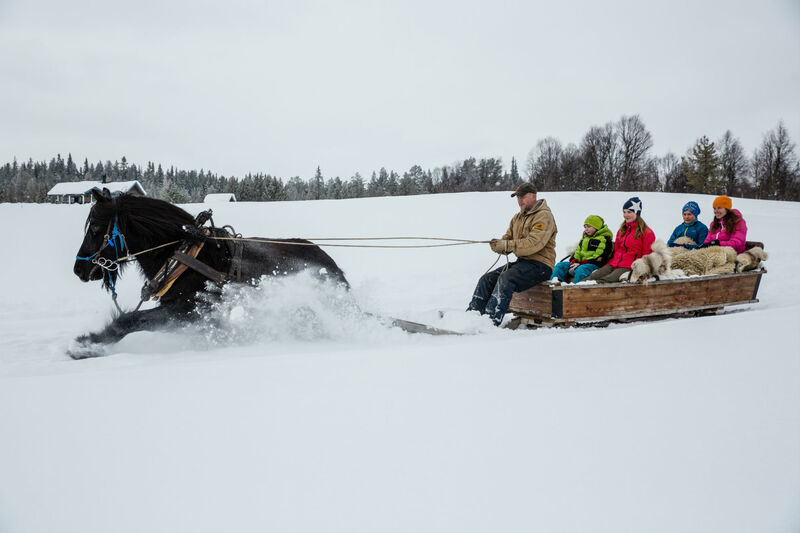 Sleigh rides are offered both during the day and in the evening to a nearby cottage for some snacks and coffee. Trumvallen, 12 kilometers from the Ski Area Vemdalen in Destination Vemdalen of Sweden. No need for previous experience. Tours are adapted to the skill of the group. 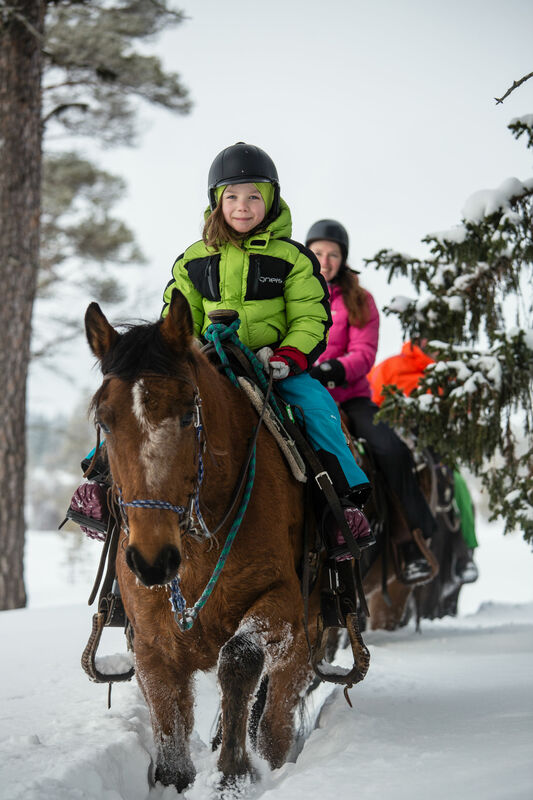 Kids need to be abour 10 years old to ride their own horse in a group outing (depending on previous experience). Experienced riders can go for a ride on their own. Maximum eight participants per group to maintain quality of the tour. 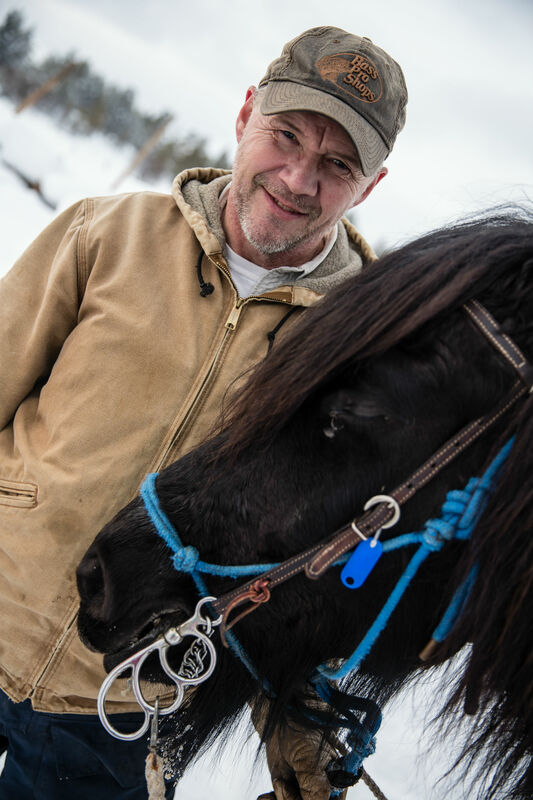 Most horses are North Sweden Horses. The Ranch also holds Quarter ponies, American Paints and Warmbloods. Wear sturdy shoes, warm clothes and gloves. Helmets are available at the Ranch. Getting to Vemdalen: Fly to Åre Östersund airport or Stockholm Arlanda. Take the train, bus, Taxi Transfer or rent a car to get to Vemdalen. There are hotels, apartments, cabins, camping and hostels in Vemdalen. Supermarkets for making your own meals or choose one of the restaurants serving local foods.